“WOW! 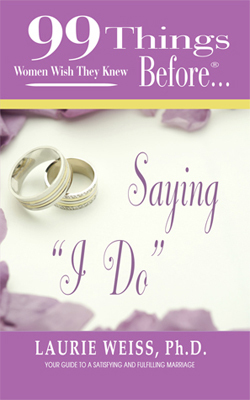 99 Things Women Wish They Knew Before Saying... "I Do" is nothing short of BRILLIANT. It is everything that we wished our mother’s had told us, but didn’t. AMEN to the truth of Laurie’s wisdom. Packed with real-life examples of women who have been there, this book offers wisdom beyond ages. Anyone who is dating, contemplating marriage, engaged or even married already will glean years of wisdom from this little black book of secrets. This book should be a pre-requisite for all to-be-marrieds. Be the best friend you can be and pick up a copy for your sister, girlfriend, daughter, or even mother, step mother or mother-in-law! There is a lot of comfort in reading about situations that are more than relatable. Kudos to Laurie for her compassion, brilliance, and love of her fellow woman. An everygreen book, this work is a MUST READ! You can’t put a rating on something this good, but if I had to rate the importance of this book, I’d give it 11 stars out of 10." speaker, radio personality, publicity specialist and author of the #1 Amazon.com bestseller, The Daughter-in-Law Rules! Author, Is It Love or Is It Addiction?